Now that Hurricane Irma has passed and left its devastating mark on Florida, parts of the southeastern US and the Caribbean, the concern for many residents is how to get home. Earlier today, we told you that JetBlue is capping its airfare to its Florida destinations, Charleston (CHS) and Savannah (SAV) at $99 for nonstop flights and at $159 for connecting flights. On Sunday, American Airlines announced it was capping its one-way direct flights at $99 and $199 for travel in the Main Cabin and premium cabin, respectively. The capped fares are good for all Florida cities that were covered under the carrier’s travel waiver, as well as Charleston (CHS), Hilton Head (HHH), Myrtle Beach (MYR) and Savannah (SAV). The fares are good for flights departing from the aforementioned locations between September 10-17. On a sample search, we’re seeing these one-way capped fares in action. For example, from AA’s headquarters in Dallas (DFW) to Miami (MIA), we’re seeing tons of availability on Tuesday, Wednesday, Thursday, Friday, Saturday and Sunday. On Monday, the one-way fares jump up to $180 via Washington, D.C. (DCA). We’re seeing similar availability from many other destinations, including Philadelphia (PHL), New York (JFK) and Chicago (ORD) to MIA. 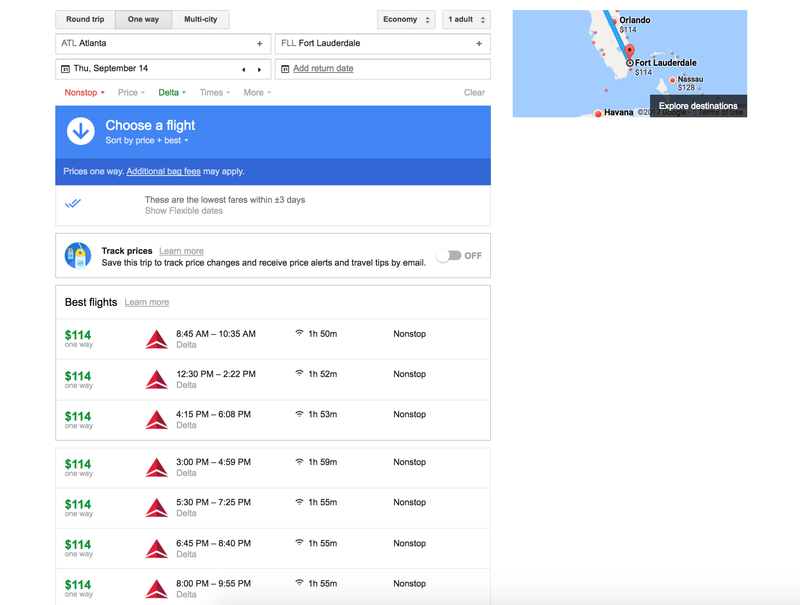 When people were looking to evacuate Florida and surrounding areas, Delta capped some of its flights at $114 per one-way ticket. And it looks like many of those fares are applicable to return one-way flights. 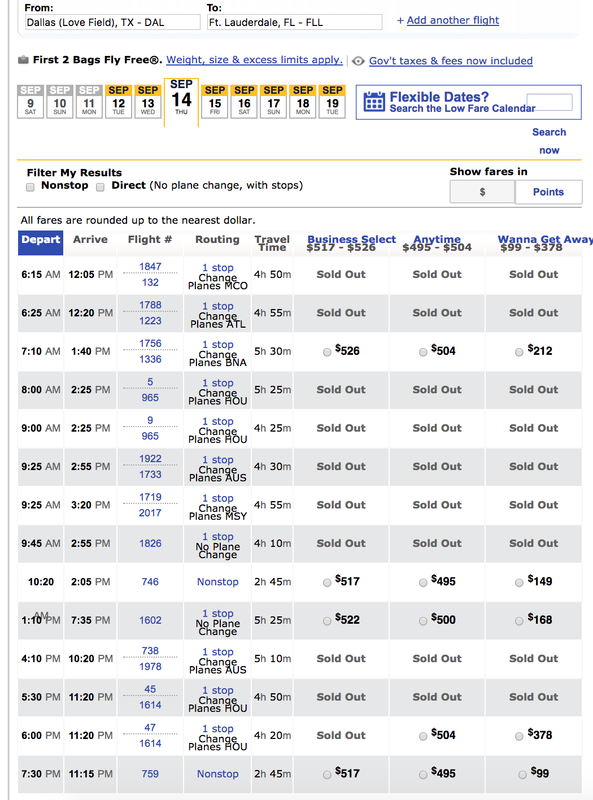 For example, we’re seeing tons of availability on one-way flights from Atlanta (ATL) to Fort Lauderdale (FLL) for $114. We’re seeing these fares for departures on Tuesday, Wednesday, Thursday, Friday, Saturday and Sunday. Beginning Monday, they jump up to $175. Similarly, we’re seeing these $114 one-way fares between Detroit (DTW), New York (JFK) and more to FLL. As previously mentioned, JetBlue is capping its flights back to its eight Florida destinations, as well as Charleston (CHS) and Savannah (SAV) at $99 for nonstop flights and $159 for connecting flights. On a sample search between its hometown of New York (JFK, LGA and EWR) and Fort Lauderdale (FLL), we’re seeing tons of availability for one-way fares at $99 for nonstop flights. On the same note, we’re seeing these discounted fares for one-way flights from its other destinations to Florida, such as Boston (BOS) and Chicago (ORD). However, if you wait a little longer, you can fly one-way on Tuesday, September 19, between New York (LGA) and Fort Lauderdale (FLL) for just $80. When we covered Southwest’s fares leading up to the landfall of Hurricane Irma, the carrier’s fares weren’t too pricey. Now, post-Irma, we’re seeing the same type of reasonable airfare. For example, between Dallas (DAL) and Fort Lauderdale (FLL), we’re seeing some availability at the $99 level for flights departing Thursday and Friday of this week. For other days, such as Wednesday, the lowest one-way fare we’re seeing is $107 with a stop in Nashville (BNA). On some other routes, such as Chicago (MDW) to FLL, we’re seeing increased prices ranging from $109 to $162 between Tuesday and Sunday. After Sunday, the one-way fares drop to around $50. When residents were evacuating before Hurricane Irma made landfall, United was the one major US carrier that had not initially discounted fares to a reasonable level — or at least one competitive with the offerings of others. And now, as residents are making it back home, we’re seeing the same kind of one-way increased prices on these routes. For example, on a search between Newark (EWR) and Fort Lauderdale (FLL), United is pricing one-way flights on Tuesday, Wednesday, Thursday and Friday at $399. Then, beginning Tuesday of next week, the same route is dropping to $80 one-way. 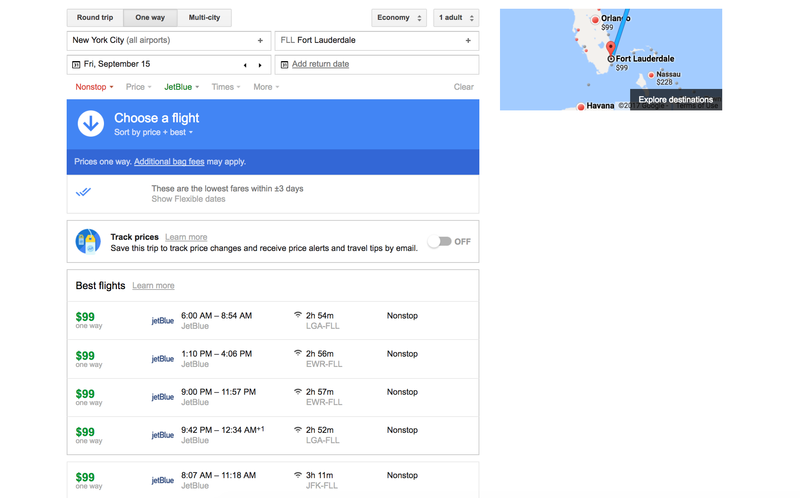 We’re seeing a similar pricing structure between Chicago (ORD) and FLL — $279-$317 this week before dropping to $55 next week. If you evacuated Florida or the surrounding areas before Hurricane Irma, you’re surely beginning to look at going back. As shown, some of the major US carriers are better than others at offering customers more cost-efficient options for this last-minute travel. If you’re looking to travel, you may want to look at all of your options before booking anything.